In the Jainism, there is a great deal of importance given to the leshya. A leshya refers to the state of mind, mental attitude. Our activities reflect our attitude. The following illustration shows how our activities vary with the states of our attitude. Once there were six friends, who were going on a trip. Along the way, they got lost in a forest. After a while they were hungry and thirsty. They searched for the food for sometime, and finally found a fruit tree. 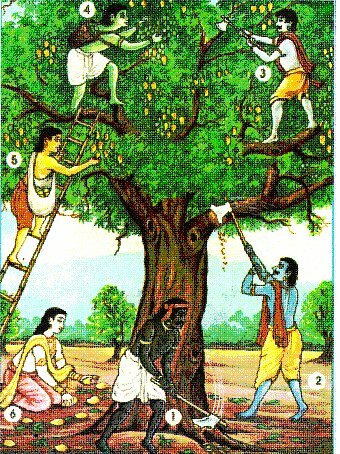 You can see that the states of minds of these six friends caused a range of thoughts that begin with the destruction of the entire tree and ended with the picking up of the fruits on the ground. The six friends’ minds represent six types of leshyas.